One man has won $28 million, the other $280,000. One man has 27 mens tennis tour titles the other has zero, one man has won 381 games on the circuit, the other 9. Yet Irishman Conor Niland from Limerick still thinks he has a shot against world No.1. Novak Djokovich in the US Open first round tomorrow. Niland is ranked 197th in the world and barely came through the qualifiers. Djokovich is the choice of most leading analysts to win the whole title. Yet Niland does not fear him. “I definitely noticed Djokovic was playing a qualifier and it was in my head a little bit, but I still only had a 1 in 16 shot of getting him,” said NIland speaking to the Limerick Leader newspaper. “My reaction was really happy - he is the best tennis player in the world, in one of the biggest tournaments, on the biggest court, it will be a great atmosphere. 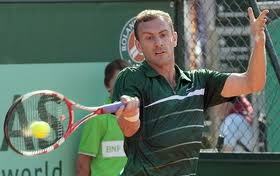 I’d rather that than playing a guy ranked 75 on court 17,” said Niland. Does NIland have a prayer? Djokovich hurt his shoulder last week in Cincinnati and who knows how the injury might affect him. Niland said he planned to keep wearing his lucky green shirts and was hoping lots of Irish would come out and support him as they did during Wimbledon. He joked he has as big an entourage as Federer at this stage. Because its Djokovich the match will be carried live. “It is brilliant. I have been really lucky, people were able to watch Wimbledon and hopefully will be able to watch this,” he said.